just for the record, i was intending on taking the summer off from homeschool. i planned on taking a break from lessons and workbooks june 1 thru at least august 1.
turns out Big Girl had different plans. "some kids get to go to summer school, too," she said, as if i were not letting her jump off the most popular cliff in town. but how could i deny her pure thirst for knowledge? that is one of the reasons we decided to homeschool her in the first place. she loves to learn in a formal, structured and focused, one-on-one setting. so we are having summer school. without much time to prep, i had to come up with something quick when she asked for school work first thing Monday morning. then i remembered the box of books in the closet that Granny gave us a few years ago. a collection of 25 "What Is/Why Is" books published by Weekly Reader. each book is about something different (What is an Ocean? What are Seasons?) and takes a simple, yet educational, approach to explaining it. they were my books when i was in elementary school. Granny had ordered them from a book fair. when she moved and cleaned out her attic we got the box of books, which were way too advanced for our then 1 year old. so away in the closet they went. each week in summer school, Big Girl will get to pick out one of the books and we'll study that book the whole week. every day we'll read the book, and then she'll do an activity/project focusing on one aspect of the book, we'll take a related outing, and find supporting Bible scripture. 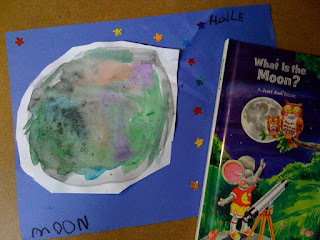 this week she picked "What is the Moon?" she is learning about moon phases and cycles, craters, and physical features of the moon. we're going to see a movie at the planetarium, and we're reading Genesis 1.
for the sake of staying on topic [and making it easy on dear ole' mamahall], i'm hoping she'll pick "What is a Space Shuttle?" next week. PS: i am excited to participate in Joy's Thirsty Thursday starting next week. she has been a very helpful go-to lately, especially with curriculum stuff and recipes. this is one meme i hope to keep up with!